Cavies' nails grow in a similar fashion to our own. In the wild, just running on hard ground and scratching for their food would wear the nails down. As our cavies spend most of their time in a cage with very little rough surface to run on, the nails will grow quite long. Therefore they will, at some time, need trimming. Just how often will depend on the individual. It is very unusual to need to cut the toenails of a young cavy. Under five months old, all that may be necessary is to take the very pointed tip off the nail to prevent your cavies from scratching you as much when you are handling them! In fact, you will often only have to trim the hind feet of a cavy under one year old. Many people are scared of cutting the nails; however, when you have done it once or twice, it will become quite easy. 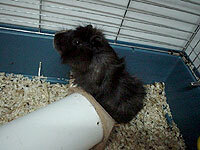 A cavy has four toes on each of its front paws and three on its back paws. The back ones are usually the ones that grow fastest. You will need a pair of nail-clippers; those designed for humans are easiest. Hold the cavy on its back on your arm, and, if you look at the nail, you will be able to see where the blood vessel runs down the nail. On a light-coloured cavy, you will actually be able to see the vein but, on a dark nail, you will probably only see a slight line across the nail. Hold the cavy's foot in your hand, and use your thumb and forefinger to hold the individual toe still. Using the clippers, just take a millimetre or so off the tip and then move on to the next nail. If done as often as you feel necessary, there will only be a small amount to trim. Regular trimming usually ensures that the nails do not become I wisted and hard, although it must be said that older cavies' nails can become hard. Even then, the nail-clippers designed for toenails seem to be strong enough to handle the job.